An ultra-modern diamond and bridal jewelry retailer, Whiteflash specializes in Ideal and Super Ideal diamonds and designer engagement rings. 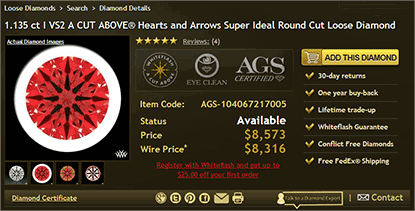 What draws most online diamond shoppers to Whiteflash is their A CUT ABOVE® brand of super ideal cut Round Hearts and Arrows and Princess Diamonds which is recognized internationally as among the elite diamonds of the world. These extraordinary diamonds feature extreme cut precision and proven light performance at the top of the scale and are well suited to shoppers with a discerning eye for craftsmanship. A CUT ABOVE® Round Hearts and Arrows and Princess diamonds are available exclusively at Whiteflash (http://www.whiteflash.com). All of Whiteflash in-house diamonds come with a Lifetime 100% Trade-up Guarantee. There are no stipulations regarding the price or quality of the new diamond. They also provide a One Year Service Plan on every piece of jewelry they sell, entitling the customer to repair, sizing, repolishing and cleaning at no charge for an entire year. All Whiteflash sales are backed by a complete satisfaction, money back return policy. Whiteflash customers are also eligible for our Referral Program which pays $100 cash for referrals that result in qualifying purchases, as well as for repeat purchases. As a service to its customers, they have partnered with Jewelers Mutual Insurance Company (Perfect Circle) to enable Whiteflash customers to get instant quotes and purchase insurance with only their Whiteflash order number. The data on the jewelry and value are automatically accessible to Jewelers Mutual through a special interface, saving the customer the cost and hassle of purchasing a separate appraisal. Whiteflash is an authorized distributor for some of the leading jewelry designer brands including Tacori, Verragio, Simon G, Ritani and others. They also build their own line of jewelry in their own shop, including complete custom design and manufacturing by Whiteflash master craftsmen. Whiteflash is the only retail jeweler certified for ISO 9000 Total Quality Management. Their quality control and continual improvement system incorporates the industries best practices and is the basis for their consistent and dependable delivery of top quality products and services.